L. E. Barrett, E. J. Gunter & P. E. Allaire, 1978. 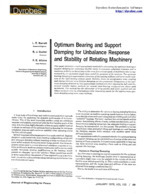 This paper presents a rapid approximate method for calculating the optimum bearing or support damping for multimass flexible rotors to minimize unbalance response and to maximize stability in the vicinity of the rotor first critical speed. A multimass rotor is represented by an equivalent single-mass model for purposes of the analysis. The optimum bearing damping is expressed as a function of the bearing stiffness and rotor modal stiffness at the rigid bearing critical speed. Stability limits for aerodynamic cross coupling and viscous internal rotor friction damping are also presented. Comparison of the optimum damping obtained by this approximate method with that obtained by full scale linearized transfer matrix methods for several rotor-bearing configurations shows good agreement. The method has the advantage of being quickly and easily applied and can reduce analysis time by eliminating a time consuming search for the approximate optimum damping using more exact methods.